This season has been action-packed with plenty of drama and excitement and we’ve seen many highlights and magic moments. Night one started as usual with the Auckland Championship’s for all classes and we ended the night with fireworks to celebrate the first night of the season. The Million Dollar Shoot Out was a new initiative which everyone seemed to enjoy, even though we didn’t get to give a million dollars away it was a lot of fun and is something to look at again in the future. We had the opportunity to watch some awesome sprint car action with the Porter Hire International Sprint Car Series. This is always a huge draw card for the fans, there’s nothing better than watching these Winged Warriors battling it out on our little bullring. Australian visitors Jamie Veal and Troy Little came over along with Shane Stewart and Kyle Hirst representing Team USA. Stewart once again cleaned the series up and we got to witness awesome racing not only by the Australians and USA drivers, but our kiwi boys held their own too. While they were here we ran a collection for Kyle Hirst who had lost almost everything in the Californian fires and thanks to our loyal fans we raised more than $10,000! Next up was the United Truck Parts International Midget Series where we had a field of 40 midget cars competing. 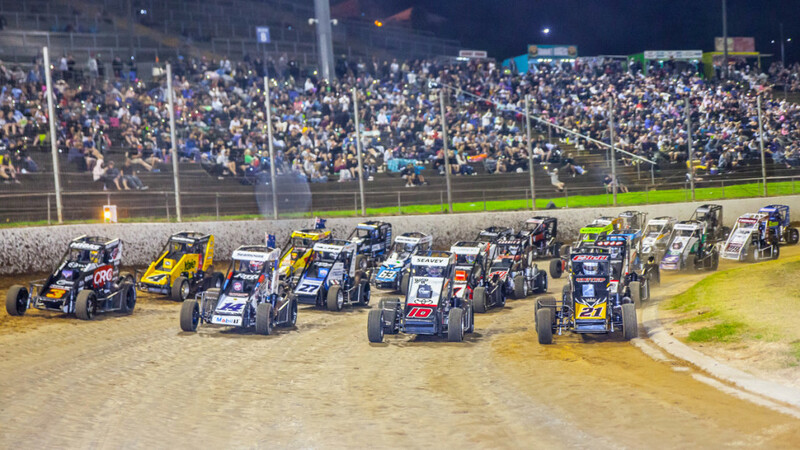 This was possibly one of our best ever international midget series to date! Boxing night saw the start of the traditional test racing with Michael Pickens captaining Team New Zealand alongside Brad Mosen and Brock Maskovich. Team Australia were represented by Matt Smith, Kaidon Brown and Scott Farmer and we were lucky enough to have ‘the Dream Team’ from USA with NASCAR ace Kyle Larson, Christopher Bell and Tyler Courtney. USA drivers Zach Dahm and Logan Seavey were also here competing in the Greenway team along with Chris Windom who was representing the Tony Elliott foundation. This series went on the road visiting Bay Park Family Speedway along with Placemakers Huntly Speedway. It’s always great when we can get the international drivers to visit tracks out of Auckland, so they get a real well-rounded kiwi experience and the feedback was thumbs up. But most of all the international drivers love coming to The Springs – Kyle Larson sent an email after the series stating that “being able to come and race at Western Springs is probably my favourite thing of the year”. The King of the Springs is always one of the international series highlights because we honour the late Bryan Clauson with a 39 lapper. We were lucky to have Bryans fiancé Lauren visit for this which was awesome. The Kiwi Kidz had their own ‘King of the Quarters’ feature race which was won for the third year in a row by one of the Kiwi Kidz rising stars Emerson Vincent. Emerson hasn’t had it all his way this season though as we have seen this class and drivers going from strength to strength. The F2 division really stepped up a notch, we even got to see them performing slide jobs in their efforts to get to the lead! This was a very strong class all season, very strong top end with several drivers capable of winning their feature races. Later in January we held the TQ Midget North Island Championship which was won by Scott Baker followed by Peter Hunnibell and Cole Morrison. Speaking of TQ’s we got to see the synchronised nose to nose donuts of the Baker boys more than once this season. This class was strong all season long with around 30 competitors almost every night and they certainly produced exciting close racing! The Heritage Shield was also on the same night and as always it was great to see the vintage midgets take to the track. For the first time ever we ran the Western Springs F2 Midget Championship which was won by Aaron Hodgson, Corbin Anderson came second followed by Leighton Kendall. We also hosted 50 kids and their families from the Child Cancer Foundation. The kids had an absolute ball and they were all given a free meal thanks to Stan from Funtime Caterers and a gold ribbon to tie on a car of their choosing. They spent a long time in the pits choosing their cars and all got a real kick out of cheering on the car which carried their name flying on the ribbon. The Barry Butterworth Memorial which is held in memory of the great speedway legend didn’t disappoint. It was great to have the midget drivers introduced with a walk down the stairs by the starting box. Michael Pickens showed his true talent once again with a midget win from the back of the field and Jamie McDonald had a stunning win in the Sprint Car division. Rolling Thunder was a huge success once again starting with round one at Palmerston North and for the first time, we took the show to Kihikihi for round two. Kihikihi Speedway put on an awesome show with a huge turnout of fans. The final round was held here at The Springs and as usual it was a really popular event with the fans. Congratulations to Michael Pickens and Dan Corrin who were crowned as series winners. The final night is when all the class series conclude, and we got to see hard fast racing in each and every class. After the devastation in Christchurch the day before we were unsure if we would even be able to have this event however we were given the green light minus the fireworks and everyone turned up. And when we say ‘everyone’ we mean EVERYONE! The place was packed, and it was an awesome sight. The final night is now over, and we look forward to doing it all over again next season!